Adding a CAA record to a domain allows you to reduce the likelihood of someone obtaining an unauthorized SSL certificate for your domain. You create a special DNS record that the Certificate Authority (CA) checks before issuing a certificate. You can create notification rules for when a certificate is requested from a CA that isn’t permitted. As of Sept 8, 2017, all publicly trusted CAs are required to check and respect CAA records. On the DNS Management page, at the bottom of the Records section, click Add and select CAA from the menu. Name - Type @ to point the record directly to your domain name. Flags - Type the number 0. Tag - Type issue (or issuewild if you would like to allow wildcard certificates to be issued for this domain). Value - Type godaddy.com or starfieldtech.com (GoDaddy can issue certificates if one of these two values is found in the CAA record - you will need to enter additional or different values to allow other CAs to issue certificates for the domain - these values are provided by your CA). TTL - Leave at default of 1 hour. 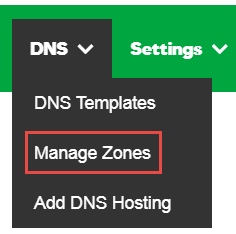 On the DNS Management page, at the bottom of the Records section, click Add and select A from the menu.